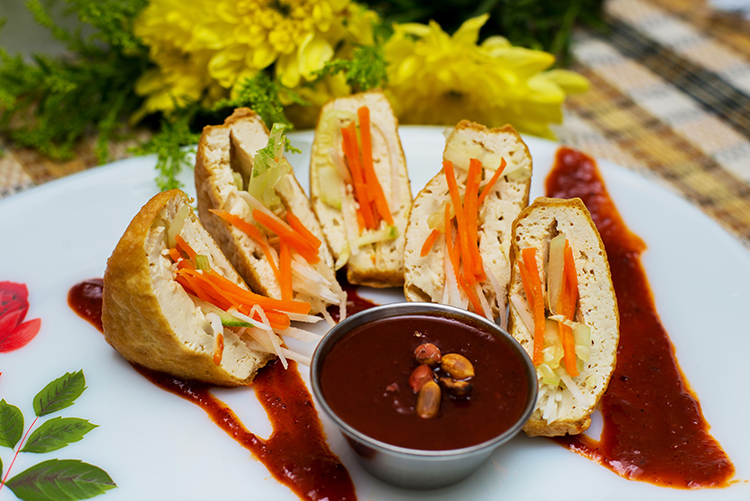 This vegetable stuffed tofu appetizer with peanut sauce is a famous dish of Malaysia. Add oil and chilli paste into the heated wok. Add the water, chilli sauce and tomato sauce next. Simmer on low heat until the gravy thickens. Grind the roasted peanuts and add into the gravy and stir well. Serve peanut sauce with the Tauhu Sumbat (stuffed tofu). Cut the tofu block into squares. 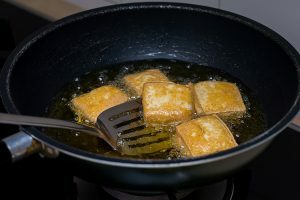 Deep fry the tofu pieces in vegetable oil. Mix the julienned cucumber, turnip and carrots together. Cut the fried square piece of tofu diagonally into 2 triangles. Then slit the triangle tofu piece and open it up with your fingers to stuff the vegetables into it. Serve the stuffed tofu with the peanut sauce.